Cartagena, also known as Cartagena de Indias, is Colombia's fascinating Caribbean resort city and one of the country's most popular destinations. History and nightlife, beaches and churches, a colorful walled city and colonial architecture make it a living museum, perfect for honeymoons, family vacations, and adult adventures. 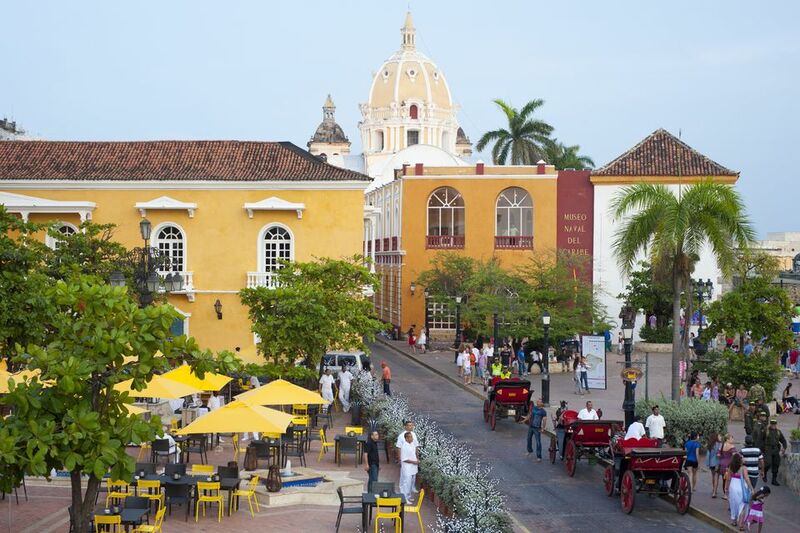 Old Town is the heart of Cartagena. For centuries, the fortress protected the walled city from pirates, storms, and other threats. Within the walls of this historic district, there are colonial buildings, churches, and plazas. One of the most popular squares is Plaza Bolivar, which is the heart of Old Town. Here, you can pop a squat on one of the benches and watch dancers, performers, and live bands playing traditional Colombian music. Accommodations and restaurants within this area, called El Centro, highlight their colonial origins. Also within the walled area, the section of Getsemani is less expensive but worth a daytime stroll. Castillo de San Felipe de Barajas is the huge fortress dominating the town. It was built by the Spanish during the colonial era in 1536 and originally called the Castillo de San Lázaro. Then, in 1657 and again in 1763, the fortress was expanded to look how it does today. Visitors now can walk the battlements, stroll through underground passages, and wonder at the labor that went into building a fort that was never used defensively. This archipelago is nestled in a national park just one hour south of the Bay of Cartagena. Here, you'll find clear waters and great diving spots. Some of the islands (such as Isla Grande) have mangrove tunnels you can kayak through, and others feature postcard Caribbean beaches with sugar-soft sand, turquoise waves, and a few palm trees. Although most visitors just boat over for a day trip, lodging is available on a few of the islands. Check out the Hotel San Pedro de Majagua or the Gente de Mar Resort if you want to stay overnight. These two areas are located on an L-shaped peninsula facing the Caribbean. While the beaches are pretty bare, this region has become the site of fashionable hotels, restaurants, and shopping. There are also fantastic clubs to dance all night, so expect a young, vibrant atmosphere. Alternately called a convent and a monastery, this colonial complex is a great place to visit for a look at colonial religious life, plus superb views of the city, the Caribbean, and nearby islands. The Convento de la Popa is a beautiful spot with flowered patios to catch the sunset over the gorgeous city skyline. It was once an additional fortress and is home to a museum and the chapel of the Virgen de la Candelaria, which is Cartagena's patron saint. Playa Blanca is arguably the most famous beach in Cartagena. It is home to bright blue water and golden sands. You'll find locals and tourists lounging in hammocks or cabanas, grabbing a snack and drink, and relaxing in the sunshine. The beach is located on Isla Baru (one of Colombia's Rosario Islands) and is an easy 45-minute shuttle or speedboat ride from the city. Shop and enjoy art in what were once jail cells or storerooms for the fortresses. Built in the late 1700s, these 23 dungeons were built by the military during colonial times and then later used by the Spanish for storage. They eventually were turned into a jail before becoming souvenir shops. There are plenty of choices in Bocagrande (at the center of town), El Centro, and Getsemani for tabernas, discos, and bars. All the nightlife spots are vibrant, with a lot of Caribbean and Colombian music. Just make sure to be cautious in Getsamani, where the party can get rowdy. The oldest Hispanic town in Colombia, this port is used as the base camp for the hike to Ciudad Perdida (The Lost City) and a stopping point moving onto Tayrona Beach. It is located on the Caribbean Coast among the Sierra Nevada, about 4.5 hours north of Cartagena by car. Tayrona National Park is home to wild jungles, rugged coastlines, and exotic wildlife. After a thrilling hike to the Lost City, travelers can unwind on one of the beaches in the area. With white sandy beaches alongside the jungle, there's an opportunity to camp in beautiful surroundings. Cabo San Juan is the most popular strip of sand thanks to the calm, swimmable water, and the two white-sand beaches that are surrounded with tranquil hammocks and a point that juts out into the sea. This archeological and gold museum is located on Plaza Bolivar. Although much of the pre-Columbia gold collection is in Bogota, there is a healthy collection of gold artifacts and pottery from the Sinú culture. If you're keen for more history and culture head to the nearby Palacio de la Inquisicíon featuring colonial architecture. With a beautiful facade, the museum shows the darker side of history with displays of the instruments of torture from the Spanish Inquisition, pre-Columbian, colonial, and independence-era art.